Asbestos, a fibrous mineral with notable properties of flexibility, and heat resistence, has been used by humans since ancient times. In fact there is evidence that asbestos was utilized as far back as 4000 B.C. by the Greeks, who used it for wicks in lamps and candles, and were the first to weave it into cloth. The name asbestos comes from the word asbeston, which in ancient Greek meant unquenchable, inextinguishable, or indestructible. The Greeks were awed by the seemingly magical properties of the mineral, and even though its harmful effects upon the slaves that handled it were noticed, its use continued. The Romans, who called asbestos by the name of amiantus, used it in their building materials, cremation cloths, lamp wicks, and even made napkins out of it which they were said to have cleaned by throwing into the fire. Asbestos clothing was also used by the Egyptians from 2000 B.C. to 3000 B.C. to dress their pharaohs at the time of burial, by the ancient Finnish to strengthen pottery, and in the middle ages as an insulation for armor. Though there is some evidence that asbestos was in use as early as the 1300s in China, asbestos was forgotten about in Europe until the early 1700s when the first asbestos papers and boards began to be made in Italy. Russia, now one of the world's producers, began mining asbestos in 1712 under Peter the Great. 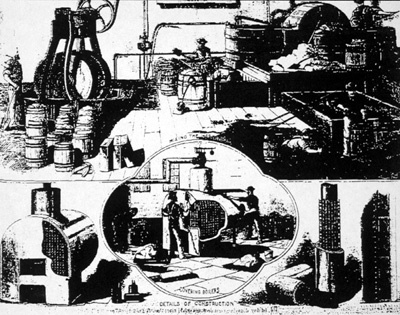 In 1800s a series of new applications began to expand the usage of asbestos. It was used in steam locomotives to insulate their boilers, pipes, and fireboxes, as well as line their brakes and clutches, it was made into packings, gaskets and pipe lagging materials and was even used for protective suits by firemen in Paris. In the 1900s the use of asbestos began to increase dramatically, especially during World War II when the military began to make use of it in ships, flares, and fireproof suits among other things. Asbestos was also used heavily in Europe in the post-war reconstruction effort. It was used in buildings to coat steel work, ceilings, walls; it was made into insulation boards and mixed into flooring and heating ducts. It was also used in cement boards and pipes due to the fact that it enabled manufacturers to decrease the width and increase the length of such products without losing strength. Since reaching its peak in 1973 asbestos production and consumption has been on a constant decrease and many countries including Germany, Italy, Netherlands, Sweden, Norway, Denmark, and Switzerland have passed comprehensive bans on asbestos mining, production, sale, use, import and export. However, many international companies have turned to the third world to make up for the shrinking first world market, and nations without worker protection laws have seen an increase in use in the past decades. Though the last asbestos mine in the United States closed in 2003 due to heavy litigation, asbestos continues to be imported and is present in numerous products on the market today.